It all started with a simple box. 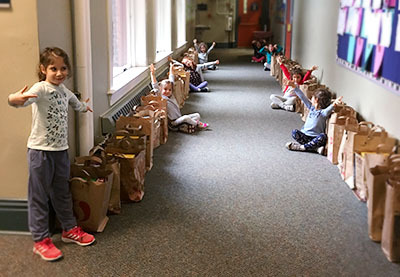 About six years ago, Seattle Hebrew Academy’s librarian asked kindergarten teacher Lea Hanan to take over the school’s food collection for the Polack Food Bank at Jewish Family Service. That worked out fine for a couple of years. But then Lea started to think about how she could do more. Do more she did. Today, bags of non-perishables from SHA students and their families come to the Food Bank by the hundreds. “People are hungry all the time,” Lea explained. 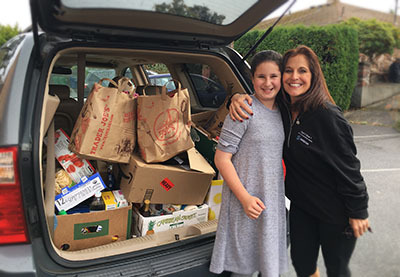 While JFS supporters of all ages participate in the annual Food Sort to organize, load and label hundreds of boxes of food and toiletries, not everyone realizes that the need is greater. With that in mind, the school and the Food Bank began to work together to understand what items JFS needs throughout the year. In February, for example, Lea said they’re using Tu B’Shevat — the birthday for the trees — for a “toilet-trees” campaign where students will collect soap, toothpaste and other sundries. For Chanukah, a Chanukkiah made from nearly a thousand cans of food — an average of 10 per student — won all of the classes a hot chocolate party. In the spring, the focus will be on kosher-for-Passover foods. “I’ll take eight items that JFS mentions they really need for Passover,” Lea said, and divide them up by grade to create a friendly competition. Having these campaigns makes it easier for the Food Bank and Brian, because he can adjust the products he orders based on what he knows he will receive. That has a huge impact on the Passover items in particular, which can be far more expensive than standard bulk purchases. “If we can make a specific ask and they can fill that ask, it’s extremely helpful,” Brian said. So, what’s it like for the students who participate in collecting all of this food? “Kindergarten is the leader of the school for the SHA food drive,” Lea said. Even after they graduate to first grade, that empathy, energy and education continues. “My goal is they carry what they’ve learned through the grades, and I strongly believe that has happened,” Lea said. It is evident by the work done by The Giving Club for the middle school, where about 15 kids meet with Lea. “They use their creativity and their minds to think about ways to support JFS and other things as well,” she said. When they’ve got a hundred or so bags filled, JFS volunteers go to pick up the donations, and the loading process becomes a team effort with the kids. Leslie Sugiura, Director of Volunteer Services at JFS, was blown away during her visit to the school. SHA has gone all-in with its Food Bank support, but any school, synagogue or organization can create the same culture of giving. JFS staff can help to customize the collection or drive with educational resources and appropriate materials. “We’re happy to help facilitate. Call and talk with us. That’s really the important thing because our needs change throughout the year,” Leslie noted. The partnership between JFS and SHA has been a shining example of how the community can support those changing needs, all thanks to the initiative Lea took and the enthusiasm she has shared with her students. Take the initiative and get involved with JFS!